As Governor Doyle prepares to release his 2005-2007 biennial budget proposal rumored to cut the UW system funding by another 10 percent, the growing coalition of UW students, workers, and community members - with a guest appearance by Santa Claus himself - delived their "Students' Christmas wish list" to the state Capitol on Thursday, December 16. "As the holidays approach, we are asking Gov. Doyle to show some holiday spirit in his upcoming budget proposal that will last beyond the season," said Alison Goetsch, member of the Student Labor Action Coalition (SLAC). "By making students a priority and fully funding education from kindergarten to college, Governor Doyle will be known as a friend of the students of Wisconsin, rather than the Grinch who stole Christmas." Gabriela Varela, Movimiento Estudiantil Chicano de Aztl·n (MEChA) co-chair, said: "We are demanding that Gov. Doyle and the Joint Committee of Finance members pursue these policies not just for UW students but for all Wisconsin residents. We are calling on them to reinvest in the public good - from higher education to health care to equal rights for all - rather than in the narrow interests of corporate lobbyists." Santa Claus, a.k.a. Mike Quieto, co-president of the Teaching Assistants' Association (TAA, AFT-WI #3220), read the Christmas wish list, which included demands for Gov. Doyle such as lower tuition, zero-cost health care for state workers, stopping TABOR and the 'Defense of Marriage' ammendments, prioritizing education over incarceration, and meeting with students before announcing the budget. 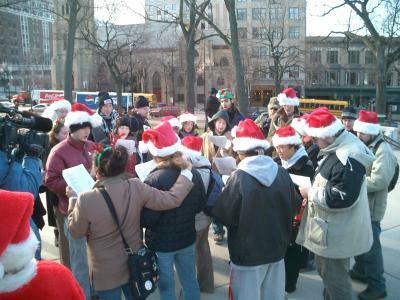 Santa also led the approximately 50 activists in singing pro-education, pro-labor Christmas carols at the offices of Doyle and all 16 members (Republican and Democrat) of the Joint Finance Committee. 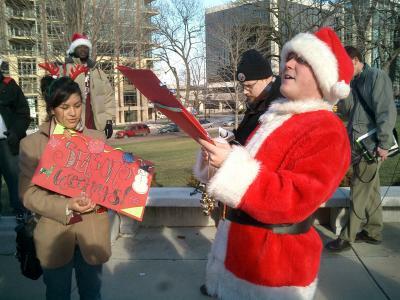 No legislator was willing to meet with the students and workers, although all of their staffmembers received a copy of the Christmas wish list as well as a candy cane or a lump of coal, depending on where they placed on Santa's 'naughty and nice' list. Needless to say, most of the legislators, including Gov. Doyle, receivd a lump of coal. Below are two of the songs that the activists sang for your viewing pleasure. Happy holidays! Oh what pain it is to see tuition hiked each day - HEY! Doyle is turning more and more college students away- HEY!